Tag line: "Horror has returned to Haddonfield"
For the time being, I’m going to skip over 1982’s Halloween III: Season of the Witch, a movie that followed a completely different storyline than Halloween and Halloween II (In Halloween III, a large corporation produces Halloween masks that can kill). Halloween IV: The Return of Michael Myers re-introduced the infamous serial killer back into the series, only this time he’s set his sights on a different member of the Myers family. Halloween, 1988. Having been incarcerated for the last 10 years, serial killer Michael Myers (George P. Wilbur) is being transferred to another facility. But (surprise!) the ambulance taking him there never arrives at its destination, meaning Michael is once again on the loose. Convinced he’ll return to Haddonfield, Dr. Loomis (Donald Pleasance) tries to get there before Michael does. Unfortunately, Michael arrives first, and immediately sets to work tracking down young Jamie Lloyd (Danielle Harris), the daughter of his late sister and his last surviving relative. Aided by Dr. Loomis, the town’s sheriff (Beau Starr), and a vigilante mob that remembers Michael’s murder spree from 10 years ago, Jamie and her step-sister, Rachel (Ellie Cornell), do everything they can to avoid the deadly killer, who has a knack for tuning up where you least expect him. 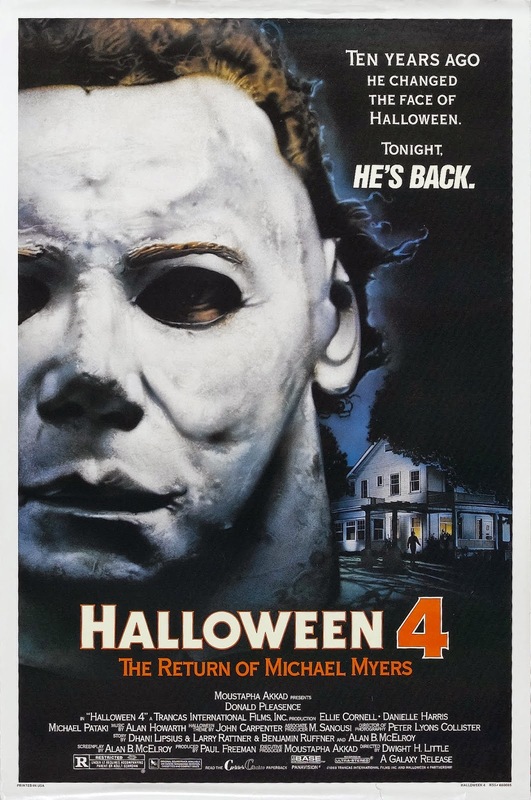 Halloween IV: The Return of Michael Myers offers fans a nice balance of old (Dr. Loomis, Michael Myers) and new (Jamie Lloyd and her step-sister, Rachel), and features several excellent scenes, the best of which has Dr. Loomis, on his way to Haddonfield, pulling into a gas station to refuel, only to find that Michael was already there, and has killed everyone in sight (when Loomis walks inside, he sees Michael standing in the next room, staring straight at him. He approaches Michael, trying to reason with him, but to no avail). This entire sequence, wonderfully executed by director Dwight Little, is incredibly tense, and many of the scenes that follow it (holing up inside the sheriff’s house, the showdown in the school, etc) only add to the suspense. And then there’s Danielle Harris, in her big-screen debut as Jamie Lloyd. Simply put, Ms. Harris does a fantastic job, portraying this battered, frightened young girl with all the confidence of a seasoned pro (she was about 11 years old when this film was made). In top form in every single scene, Ms. Harris perfectly conveys a wide range of emotions. Her performance, plus the level of suspense present throughout the film, makes Halloween IV: The Return of Michael Myers a great entry in the Halloween series. Cool post! Thanks so much for reminding me - time to watch it again! I really like this entry in the franchise. Totally with on the scene in the gas station. As a kid the ending totally blew my mind. Great film.